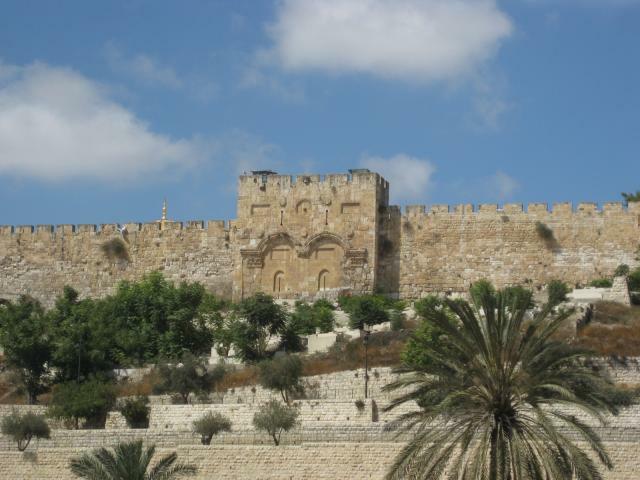 A frequent occurrence in the Bible is the phrase "from Dan to Beersheba". Dan being the most Northern point, Beersheba being the most southern point. 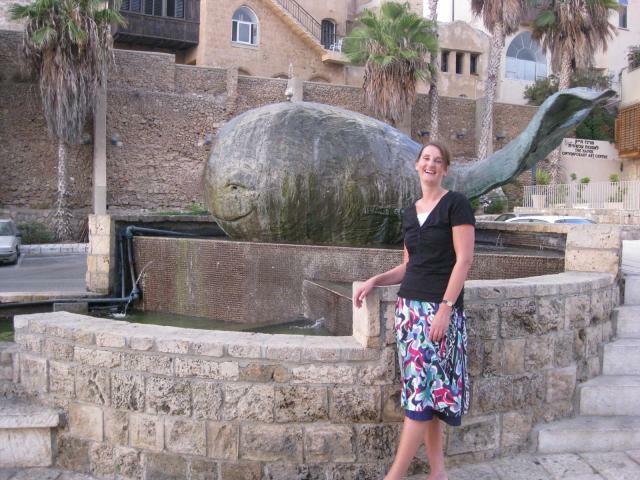 We had been in Dan, so we had to be in Beersheba as well. 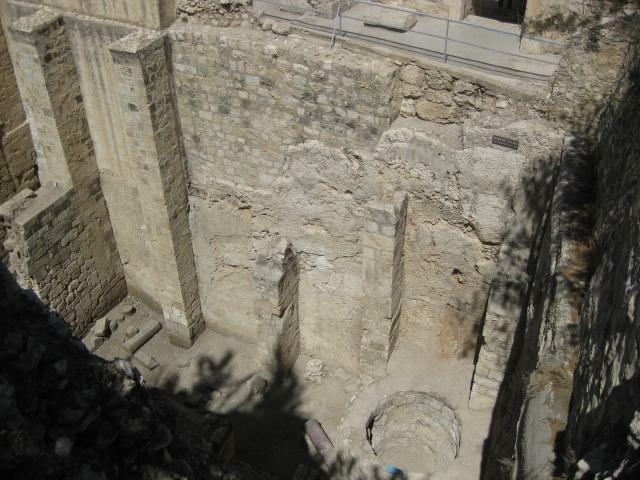 Here a picture of Abraham's well, according to Muslim tradition a well Abraham dug here. 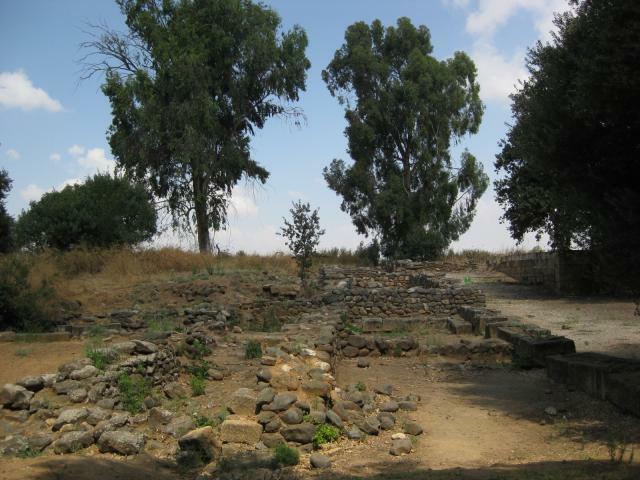 From Genesis we know it as the place where Abraham swore to Abimelech, or the place where the angel of God met Hagar when she was willing to let her child die. 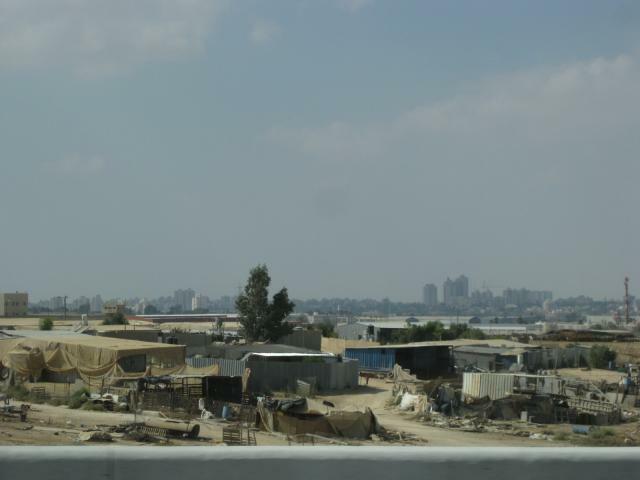 Supposedly south of the city you find Bedouins, still living in tents. We couldn't find them though. Regardless, we can now say we traveled Israel from Dan to Beersheba. We had a very good Sunday this time. The last one hadn't been very good. 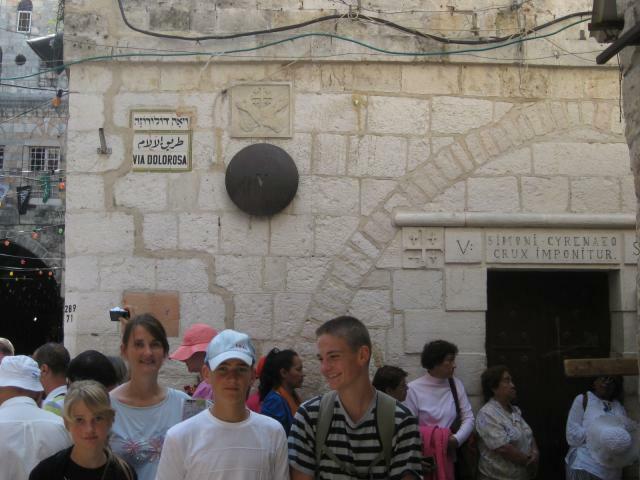 We were in Jerusalem at that time. In the morning we had gone to the service of the Church of Scotland, but it could have been Anglican for all we know. We still don't know what the minister "preached" about. But we met a guy from Pennsylvania who had been touched by the gospel. 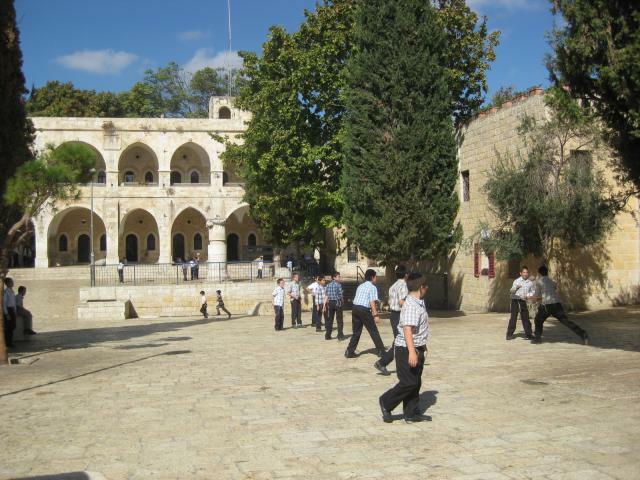 He was studying Biblical languages and was in Jerusalem for a semester. It's not that we hadn't looked, it's simply extremely hard to find a church who has a service on Sunday. Sunday is really the first day of the week here, and everyone works. The Saturday, the Jewish Sabbath, is the day of rest, and in Jerusalem at least it's a day of rest that surpasses that found in Urk (perhaps not that in Staphorst, not having been there I do not know). Churches therefore tend to have their services on Friday night (the beginning of the Sabbath) or on Saturday. Having services on Sunday morning is hard. One should have been in Israel to understand that. Even Sunday night is already had, as it appears people here work very long hours, with little time for their family. Observing the day of rest on Sundays requires great sacrifices. In the evening we had gone to a Messianic church. There wasn't really a sermon. The sermon was about their mission statement. I found the message had merit (Ida didn't), but the Bible was only used to support their mission statement. And it was charismatic. Most of the time of worship was taken up by the band. Unlike the Church of Scotland the songs were taken mostly from the Bible, but tend to be shallow. Praise God we sing psalms. It's just something you cannot really express, but singing something where you don't have to doubt it is true, nor singing something where things are left out, is priceless. God ordained the psalms to be sung and for a very, very good reason. But anyway, back to our Sunday in Jaffa. There were no services in the morning, for reasons detailed above: there wouldn't be any churchgoers. So we continued listening to Joel Beeke (we're following his sermons on Genesis). At 1.30pm we were picked up by Rev. J. Golby. We had met him already the evening before when he had picked us up to talk about the work he does in Israel. He currently is working on improving the Delitzch translation, the translation of the New Testament in Hebrew. We got a good impmression of what is going on with that. Invaluable work really. Previously he was involved with the translation of the Westminster confession into Hebrew. He had also invited a Baptist minister, Tom, he knew quite well. We had family worship after lunch, the first for our Baptist minister. It is just so nice to be among like-minded people in Israel. In the afternoon we could read from his library, while he prepared further for the sermon that night. He gave me a copy of Wilhelmus's à Brakels The Christian’s Reasonable Service. It's frankly chills ones spine to read what Wilhelmus wrote about the future of Israel. Just based on Biblical texts he wrote what woudl happen, what we can see with our own eyes today. For example that Israel would become a nation again. Something impossible in the 17th century, a fact today. 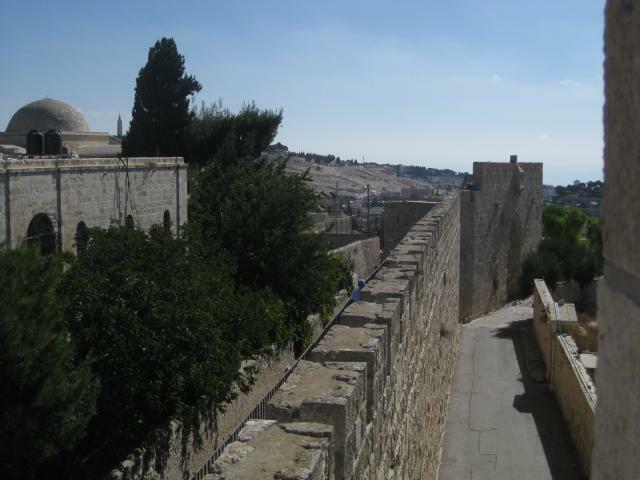 Jerusalem would be a big city, sprawling over the hills, as we have seen with our own eyes, as per Zacharia 2:4: "Jerusalem shall be inhabited as towns without walls for the multitude of men and cattle therein." How would Zacharia have known? 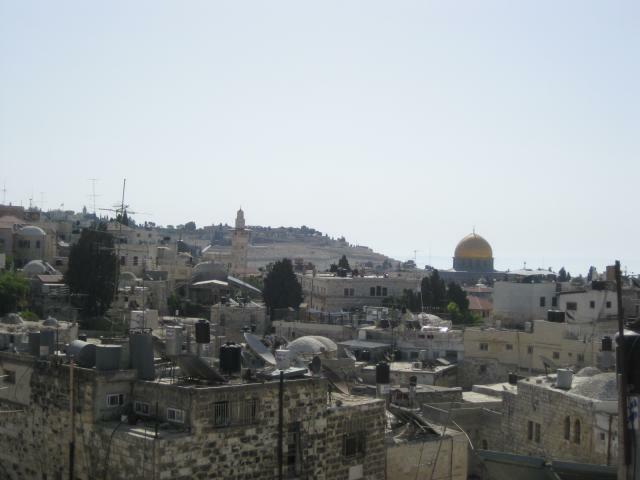 Today, Jerusalem is bigger then ever before, it sprawls over the hills, at 700,000 inhabitants. And there are many more such prophecies. People before 1948 would have to take it for faith that Israel would be a nation again. It simply was unthinkable, but they still believed it would happen. And we live in the days where these prophecies are fulfilled. 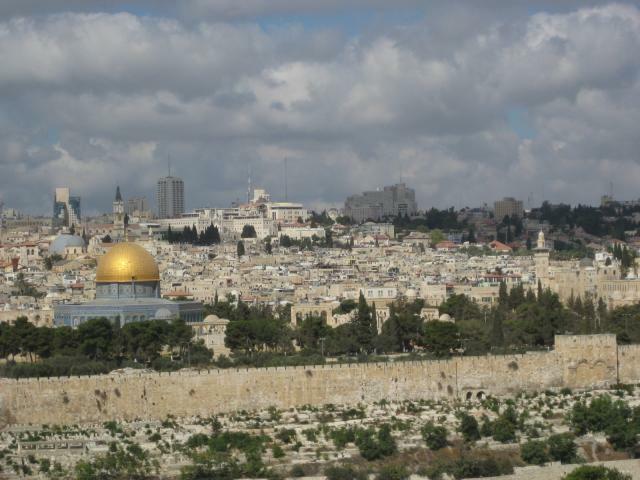 Are the prophecies that Israel will recognise the Messiah less improbable? Or take Amos 9:11: "In that day will I raise up the tabernacle of David that is fallen, and close up the breaches thereof; and I will raise up his ruins, and I will build it as in the days of old:" And so we have seen the old places rebuilt. See also this list of prophecies. In the evening Rev. 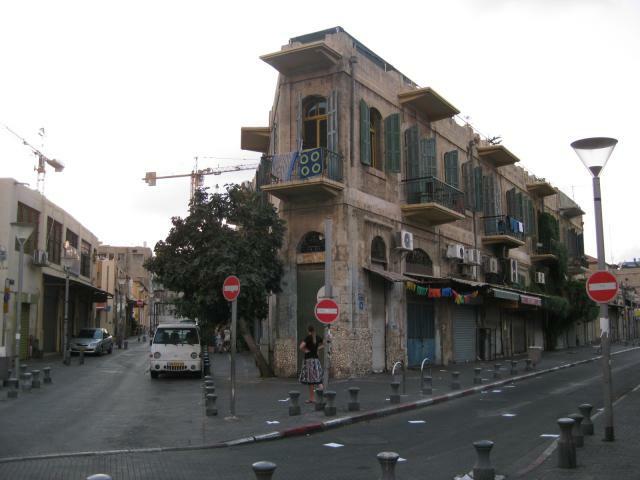 Goldby conducted the service in a run-down building in Jaffa. 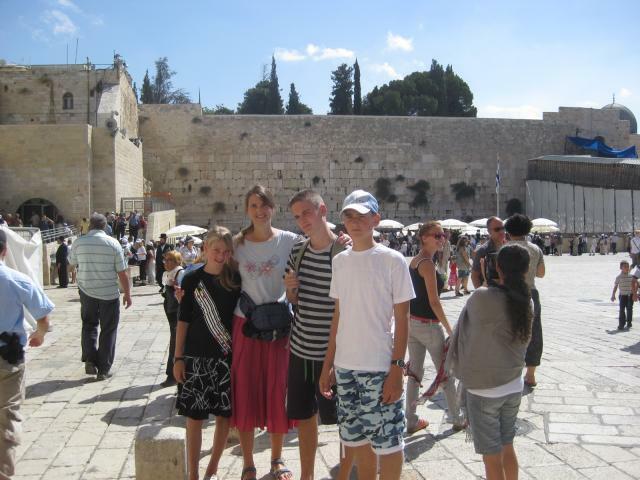 We met Sasha there, a Jew who came to Israel from the Ukraine in the beginning of the 90s. He came by boat, chartered by Christians. He told us that sailing over the Black Sea, at night, he opened the Holy Scriptures at random and read Jeremiah 31:8-9: "Behold, I will bring them from the north country, and gather them from the coasts of the earth ... I will cause them to walk by the rivers of waters in a straight way, wherein they shall not stumble". We also met Yuri, a veteran of the Afghanistan war. The desperation that came upon soldiers there, caused many to question their eternal destiny. I'm not sure I've mentioned this before, but we have met a suprising number of believing Jews. Also Mr. Godlby told us of his encounters with Jews who were secret believers. It seems entirely possible that the conversion of Israel will be unexpectedly swift. May that day came hastily. It's clear Mr. Goldby is doing very important work here. We're not sure he will stay much longer in Israel, but a presence of the Free Presbyterian Church of Scotland here in Israel seems very important to us. We're glad to have had the opportunity to be present in this country and to have seen the fulfilment and fulfilling of prophecy. 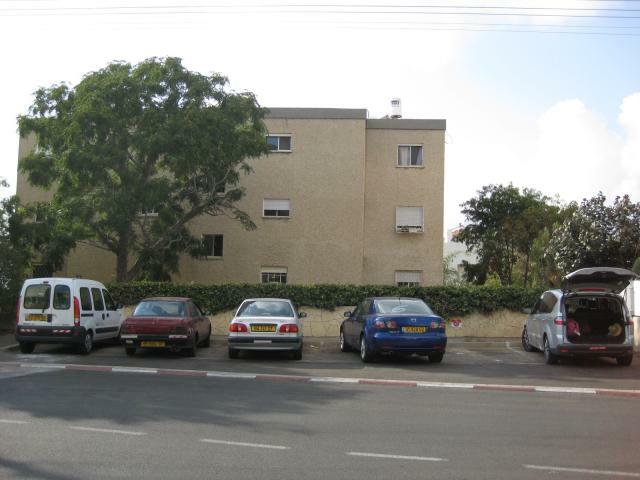 Jaffa itself is very small, and not very interesting. In the KJV it is known as Joppa. The haven Jonah went to flee as far as possible from Nineveh. In the New Testament we read about it as the location of the house of Simon, a tanner, where the servants of Cornelius found Peter. And this is the roof of the house. We couldn't get any closer, as it appears to be a private home. 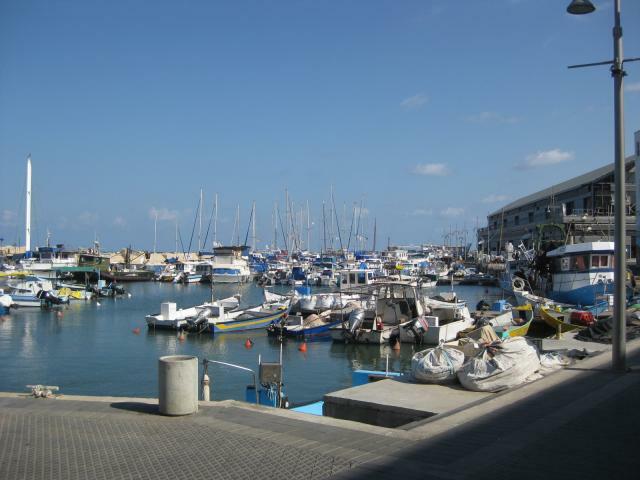 The modern harbour of Jaffa. And then something that's not in the book, the school where Rev. Golby's daughter went. For those reading this who do not know Mr. Golby, he is a minister from the Free Presbyterian Church of Scotland, ministering in Israel. I will do a separate post on his work here in Israel. Our hostel in Jaffa, the Old Jaffa Hostel. The worst place we've been so far, very noisy, too hot for me at night, and no airconditioning. On the other hand, staff was very friendly, and it was very clean. Toilet facilities were ok. Showers were split in male/female, but had no privacy. In the men's one it was basically army style. Or sleep: sometimes. As you can see it's surrounded by three streets, not very busy, but you have those kids with enormously loud speakers who tend to come down at 3am or so, and just shake you awake. Just a lot of noise. And it's hot, no airconditioning. Auke and Dieuwe slept even more interesting: on the roof. There were no more rooms, and for the noise it didn't matter. Perhaps even cooler outside. 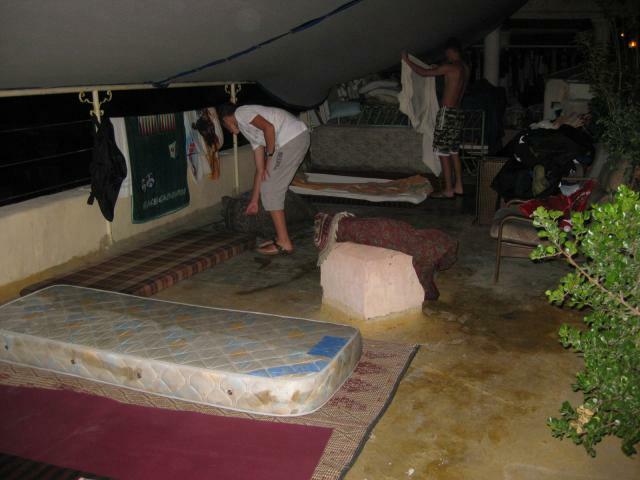 The only problem was that at 7pm the rain started to poor, so they had to run inside. So they didn't get a lot of sleep either. 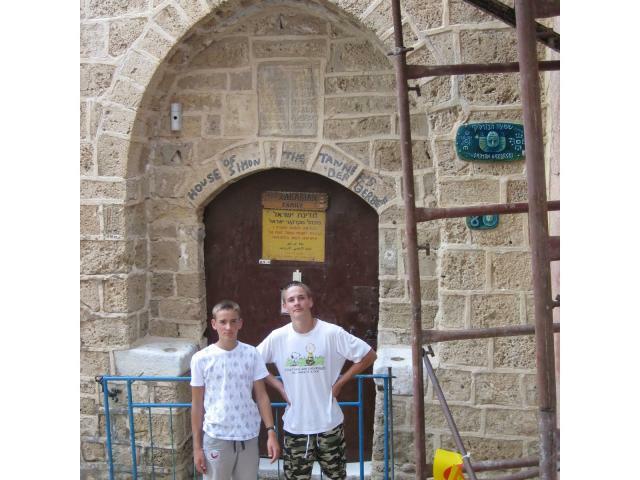 So we didn't do a lot in Jaffa. 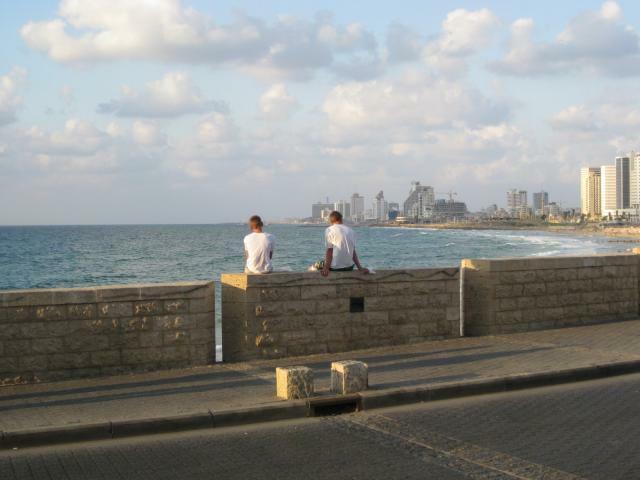 It's basically a suburb of Tel Aviv, a modern city, and Jaffa itself is very small. Dinner on Saturday night was very simple as well: a hot dog. But a big one :-) Here Auke and Dieuwe eating one while looking over the beaches and the Mediterranean. 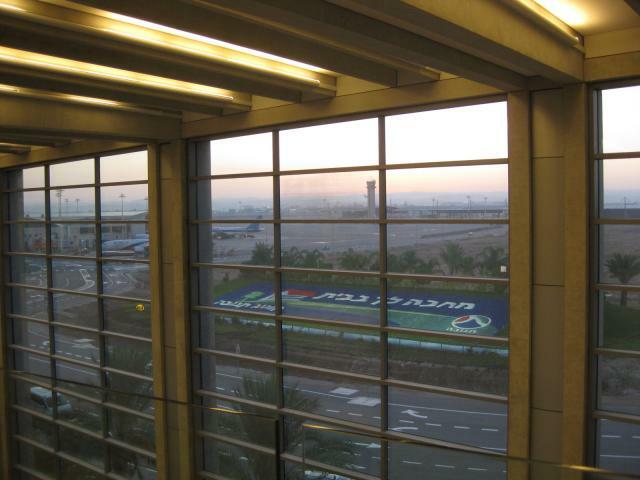 We're now at the airport, waiting to board our plane to Amman (Jordan). From there we will fly to Cairo. 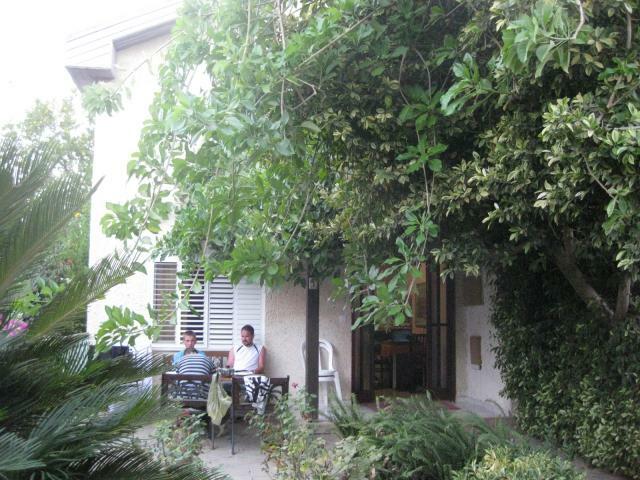 On Saturday we left our B&B in Haifa very early, at 8:10am. 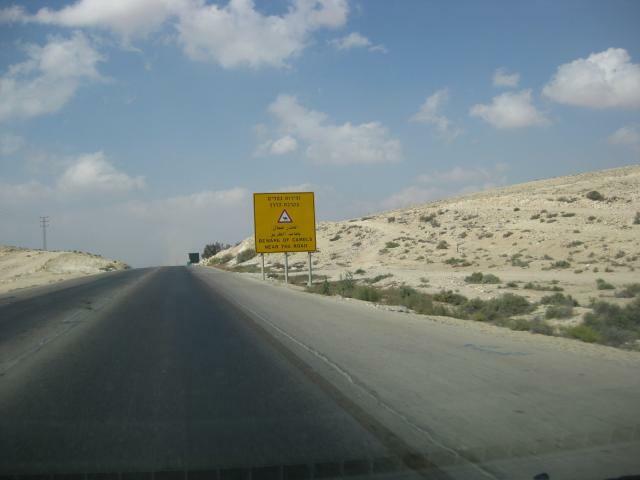 The goal was to get to the Egyptian consulate in Tel Aviv to get a visa to pass the Taba border. It seems you can't get it at the border itself. We had called the consulate before, but they don't speak English, just kept saying Visa 9am to 11am. We first understood this meant to call between that times, but when calling between 9am and 11am a second time we understood we had to be there in person. We asked about opening times, they were closed on Fridays they said, but open in Saturday. When we were that at about 9.30am, the consulate was closed. There was an intercom outside, which answered. But the person told it they were closed! And wouldn't reopen till Wednesday!! And we needed to have a visa before Tuesday. So after some research we were left with no other option than to buy tickets to fly from Tel Aviv to Cairo at 241 EUR a person as we have to be in Cairo on Wednesday for our flight to Singapore. Ouch, ouch, ouch. Not a good start of a sweet year. So instead of taking the bus back through the Sinai desert, we'll be flying to Jordan, and them from Jordan to Cairo. A 7 hour trip as well. 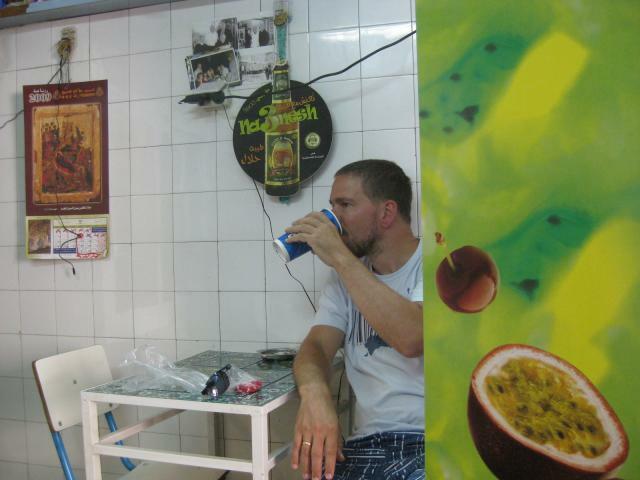 We were actually quite tired from the previous day, the heat was on again, and both Ida and I hadn't slept that much. So not too much on for today, Friday September 18. 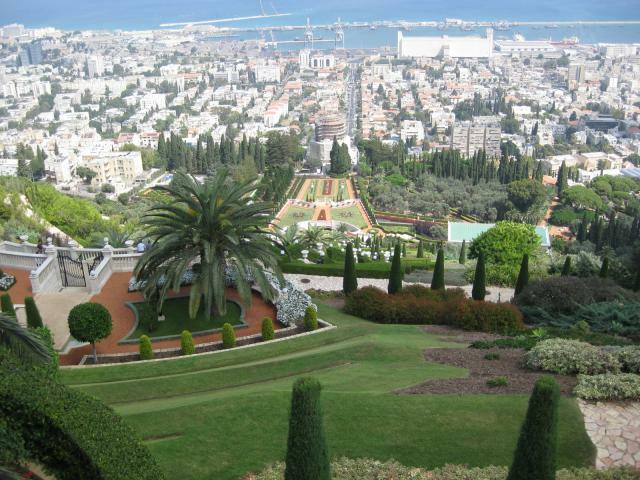 First we went to the top of Baha'i Gardens, from where you have a good overview of the North East of the city. We didn't enter the gardens (all costs money), but it's clearly a garden where a lot of money is spend on. 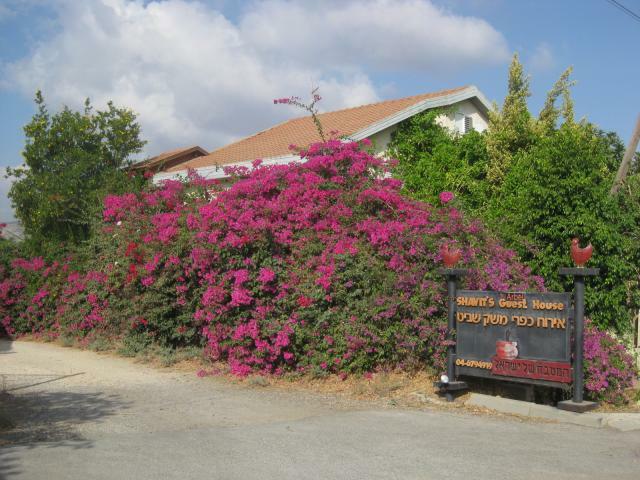 The next thing we wanted to see was about 44 kilometres away, the location where Elijah and the priests of Baal contented and where he perhaps saw a little cloud coming out of the sea. Unfortunately another church was built on this place, and it was closed between 12.30pm and 14.30pm. We arrived at 12.50pm. You couldn't really see a lot there or check this might have been the location. Moreover, not all of us would be able to enter, as shorts were forbidden (happens at more sites). So we drove to the beach. Here Haifa, the backdrop for the beach. And here the kids in the Great Sea, or Mediterranean Sea in modern language. Today was also Rosh Hashana, the start of the new year. It's also the first of the High Holidays, a series of Jewish holidays. The American land lady of the B&B told as that at Rosh Hashana the Jews eat apple dipped in honey, as a wish for sweet new year. She herself had a dinner, so we had the house all to ourselves. Ida had cooked a meal, but a friend of hers had brought us some apples so we could also hopefully receive the taste of a sweet new year (it didn't help, see one of the next stories). 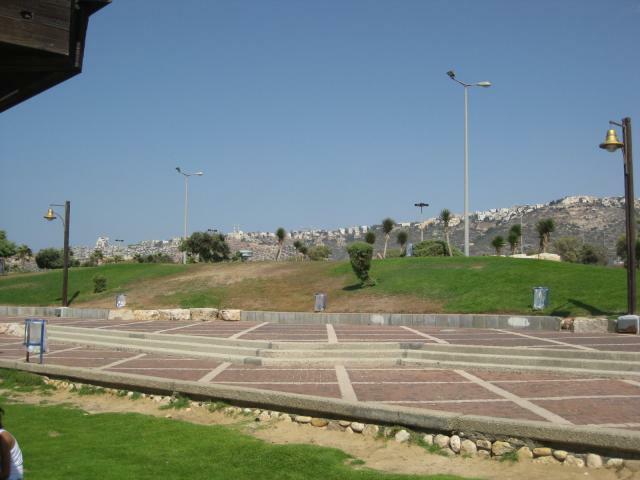 On Thursday September 17 we left our guest house, and went past one more site next to Tiberias: the location of the sermon on the mount. 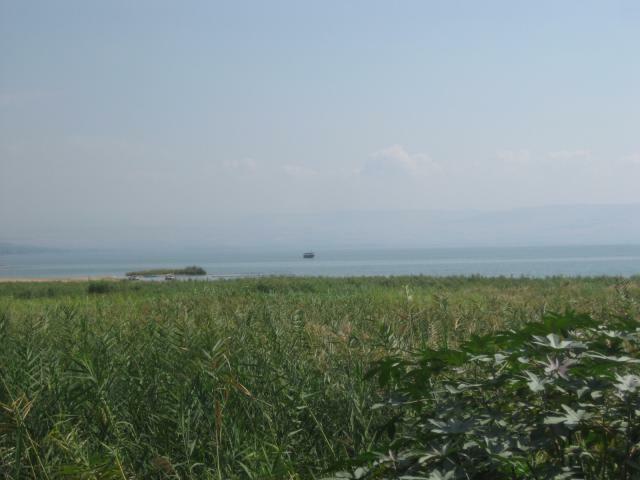 This is the Sea of Galilee, taken from the supposed location. Unfortunately the site (if this is the site) is, again, spoiled by the Roman Catholics, who build another set of buildings here, and masses and what have you going on all the time. It also doesn't really look (any more) like a suitable location. Here the car park. 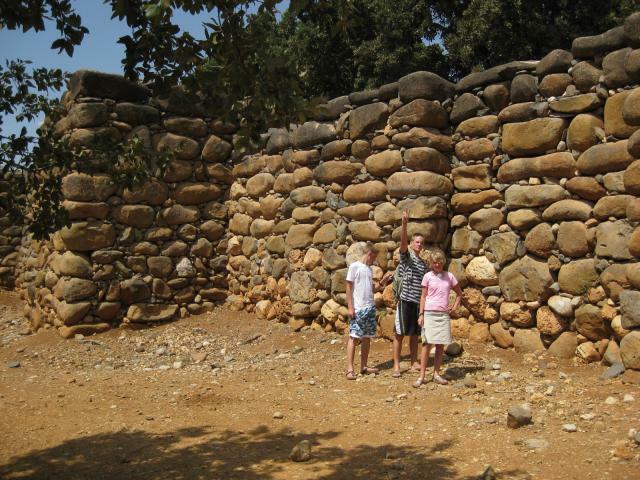 Next we drove all the way North, to the most Northern point of ancient and current Israel: Dan. 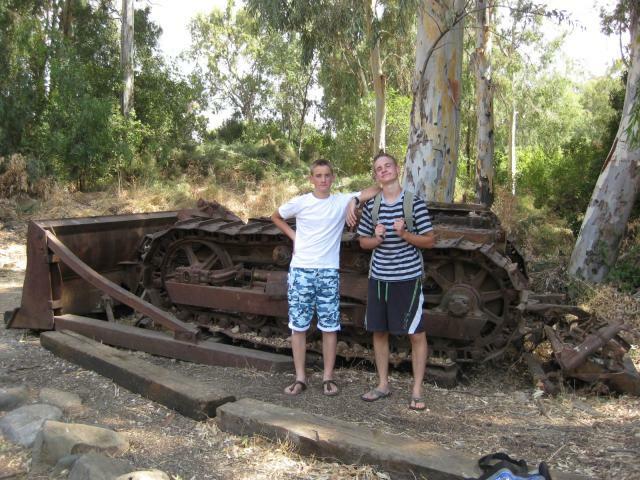 This is at the foot of Mount Hermon. 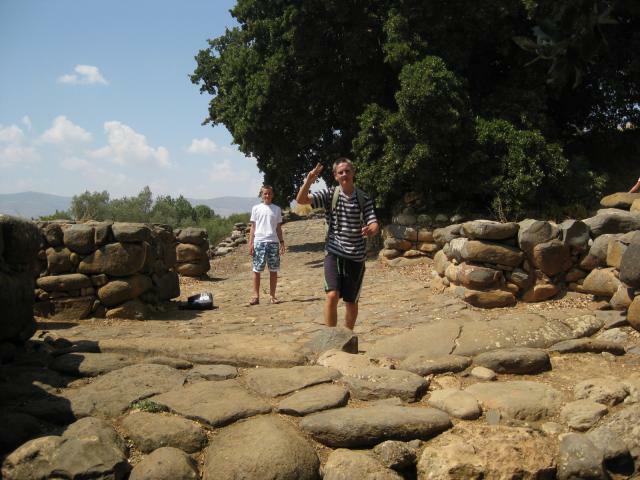 It is also the location where the Jordan finds it origins. We went there to see both. Below us at the main source of the Jordan. The Jordan is fed by many springs, but this is by far the most important. 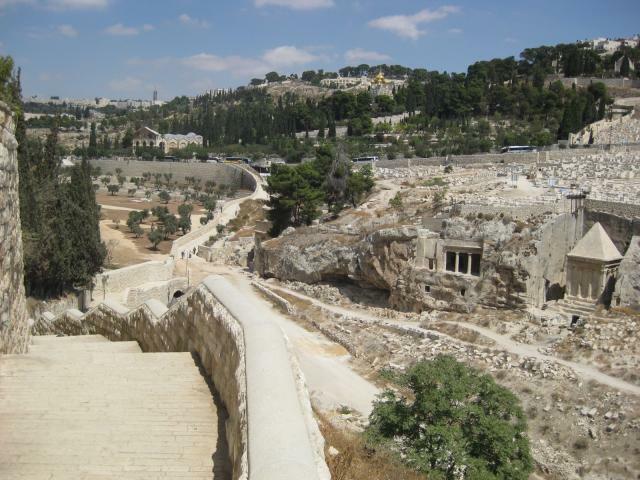 And here the location where Jeroboam built his altar and put his golden calf. There is also a platform as the Romans also built a temple here. 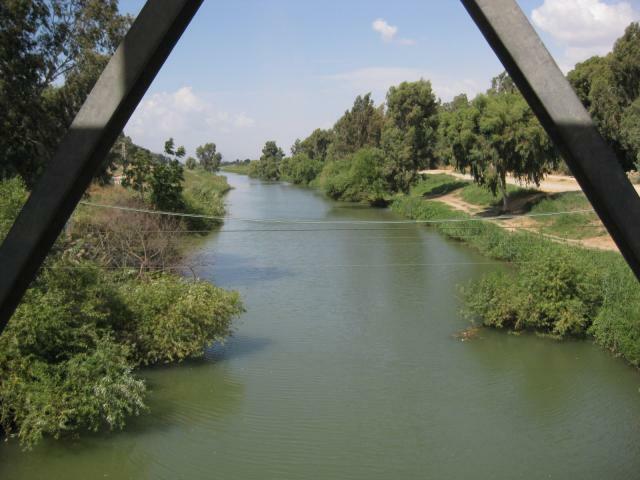 The Israeli border is also near by. 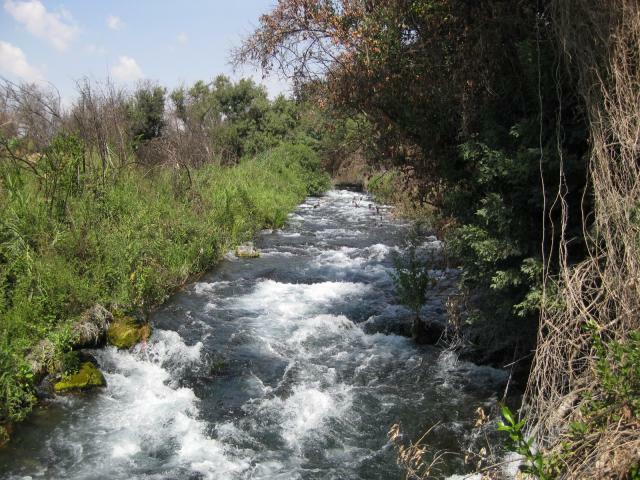 In 1964 Israel and Syria fought a minor war here as Syria attempted to divert Jordan's biggest spring for its own use. 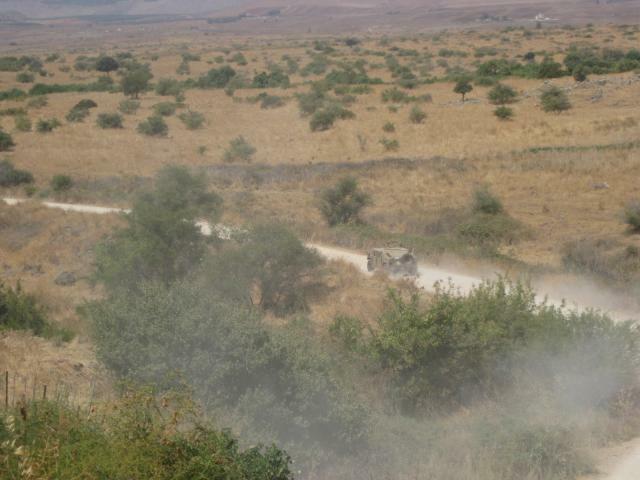 Israel paved a road along the border, so they could patrol it I presume. I think this might be one of the bulldozers used for that project. And then we came to the city of Dan, formerly Laish. As the Bible says in Judges 18:29 "And they called the name of the city Dan, after the name of Dan their father, who was born unto Israel: howbeit the name of the city was Laish at the first." 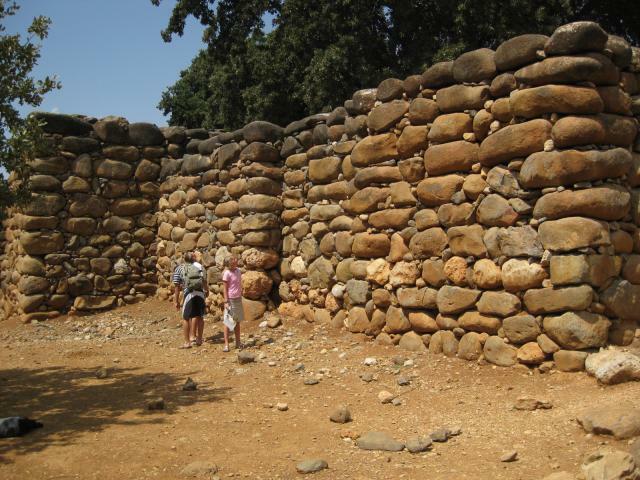 These ruins are now also famous for the Tel Dan Stele, the first inscription outside the Bible that mentions the house of David. 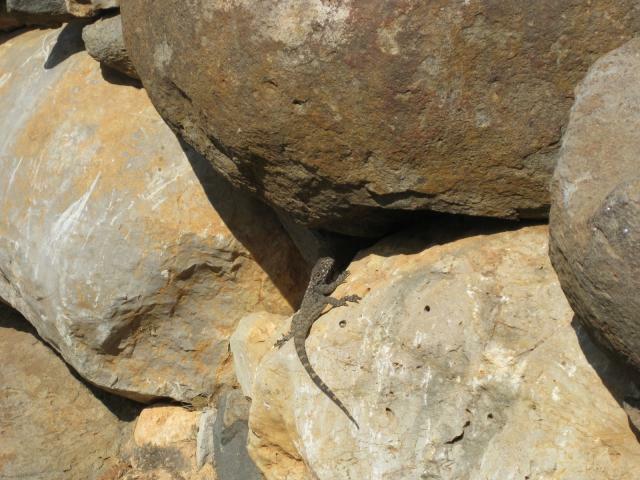 At Dan we also saw a fairly large lizzard, hand-sized. 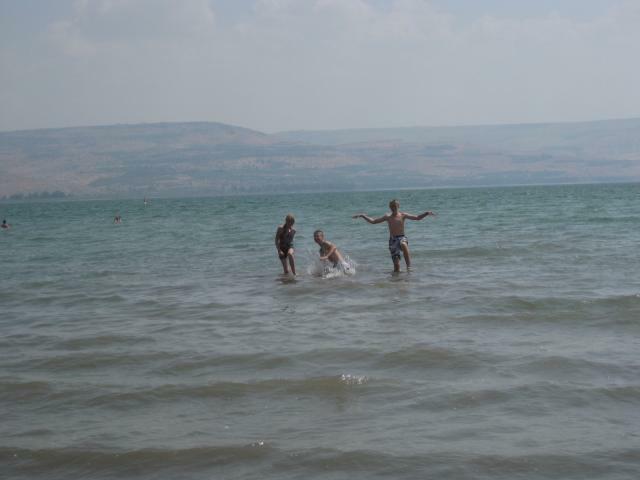 I had seen a bigger one at the Sea of Galilee already, but this was the first time the kids saw a really big lizzard. 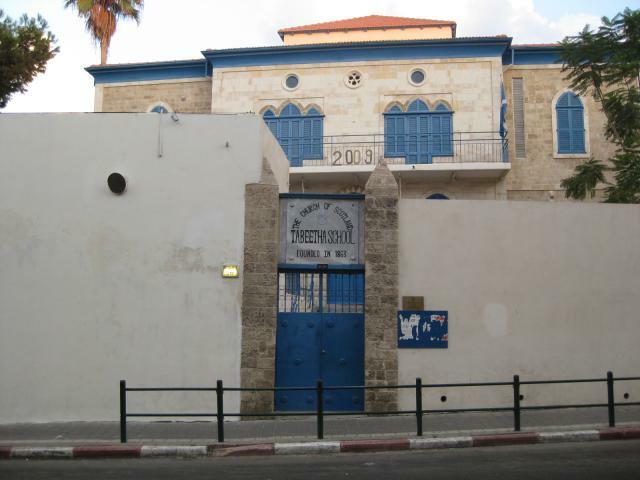 Below is Abraham's gate, so called because the gate is dated to the patriarchical era, and because Abraham traveled to Dan to rescue his brother Lot: "And when Abram heard that his brother was taken captive, he armed his trained [servants], born in his own house, three hundred and eighteen, and pursued [them] unto Dan." All this walking and the heat, 35C if not more, makes one very hot. Here Auke dipping his head into a pool. 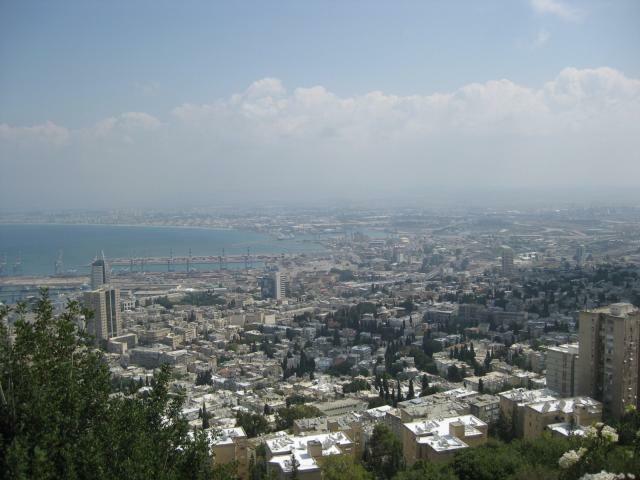 And then it was time to drive all the way West, to Haifa. Here our B&B. It's called the quiet place. It was cheap, so won't complain too much, but it wasn't that quiet, being woken up at 5:30 by the lcoal garbage collection. It also didn't have an airco unfortunately. For me the day wasn't over as I had to drive down the Tel Aviv at night to meet with a Canadian client who happened to be in Israel at this time. So that was another 1.5 hours South, and then back. It was past 12 when I was back in Haifa. At the Sea of Galilee we stayed at a very nice guest house (in Arbel, 2km North from Tiberias, which is on the West side of the lake). 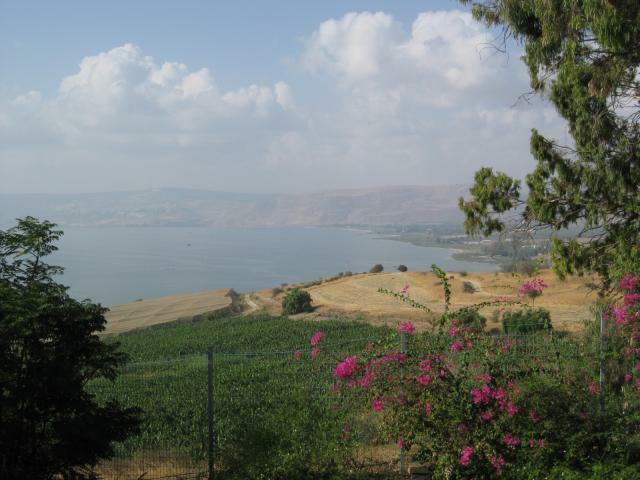 On Wednesday September 16 we drove around the Sea of Galilee. 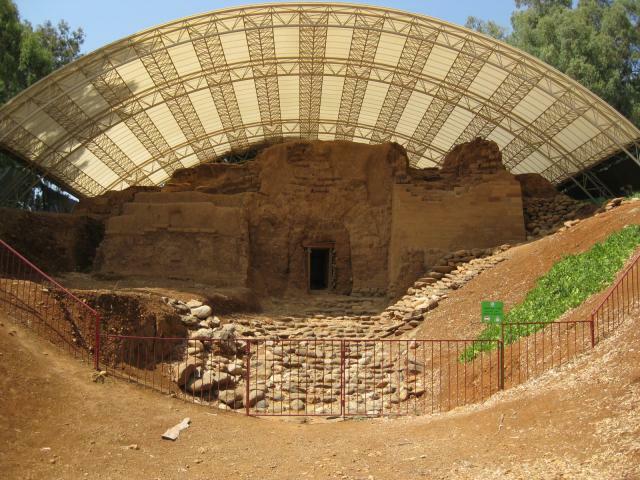 We visited Magdala, the village where Mary Magdalene (Mary of Magdala) came from. We couldn't find the ruins of the old city though, but drive to the new city built next to it. 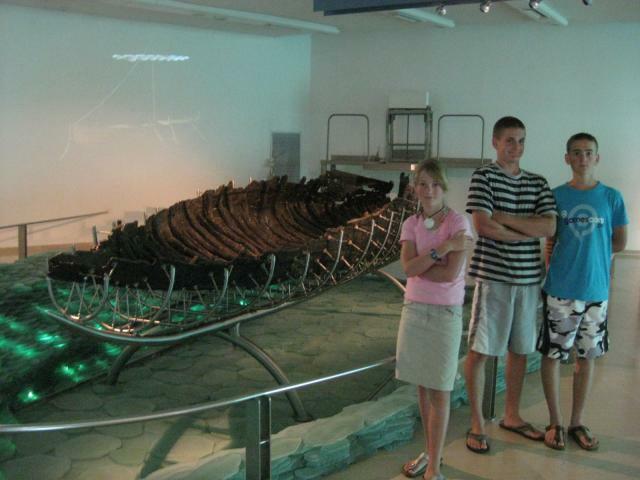 We also stopped at a museum that had on display a boat used by fishermen on this lake about 2,000 years ago. It's about 8.2 metres long. 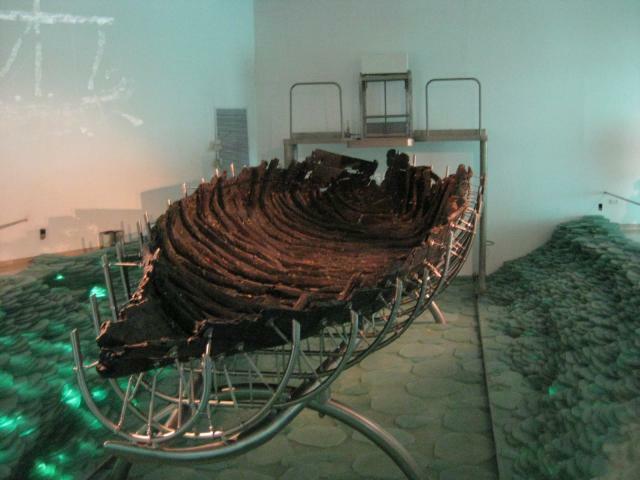 It took ten years to prepare it for display, after it had been found when a portion of the Lake fell dry. Some boat on the lake. You don't see many boats actually, usually it's just empty. It was again incredibly hot, so we spend hours and hours at a beach. 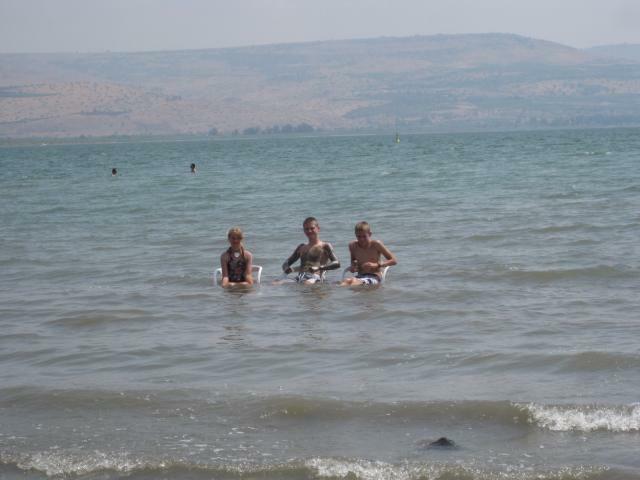 Beaches are not free, we had to pay 50 shekels for the whole family. And the water was warm, so warm you could stay in it for hours. Probably 34 degrees or more perhaps. After a couple of hours we decided to continue our drive. 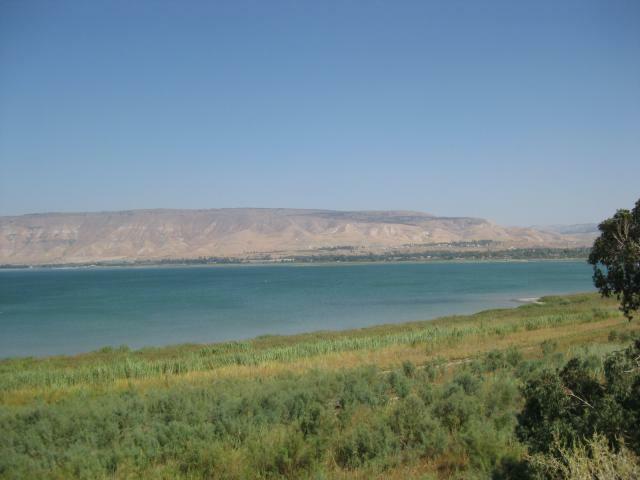 We know have a good idea how large the lake is, and where things are, such as Caperneum, where the sermon on the mount might have been, where the possessed man of Gadara was, and so on. This is almost back at the guest house, where an interesting rock formation shows the northern tip of the lake through a crack in the hill. 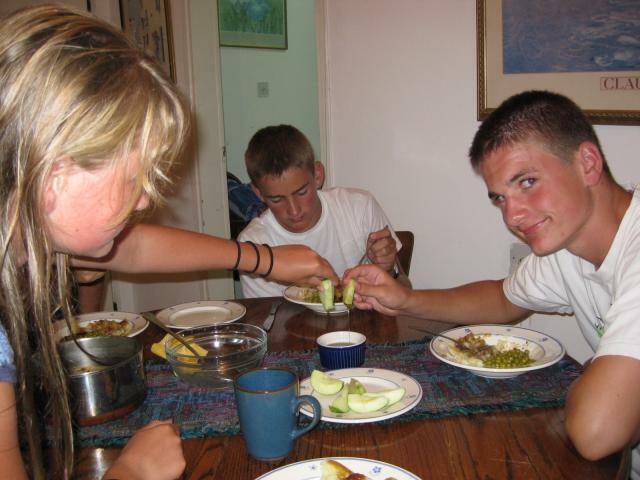 Back at our little home, waiting for dinner to start (Ida had prepared macaroni). On Tuesday morning, September 15, we could sleep in. Bit of a rest day. 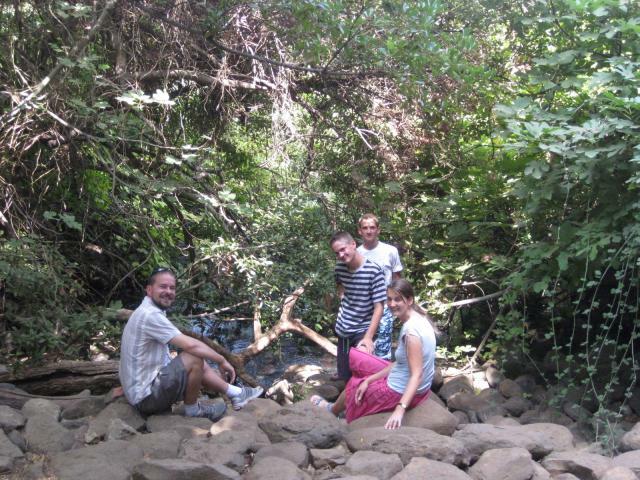 At 11am we left the Montefiore hotel and drove to Tiberias through the Jordan valley towards Tiberias. 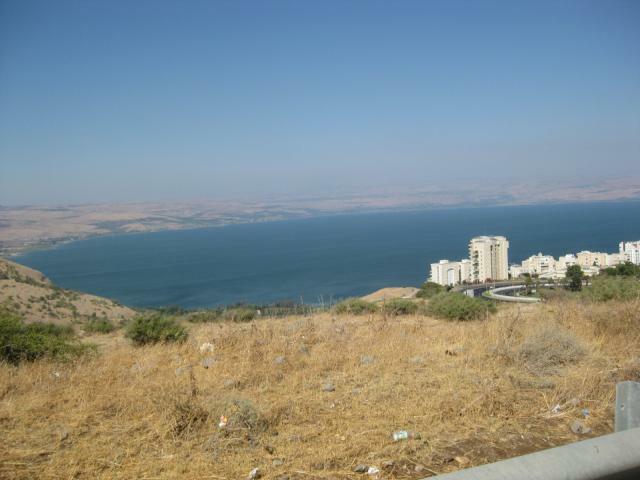 Here the Southern tip of the Sea of Galilee. 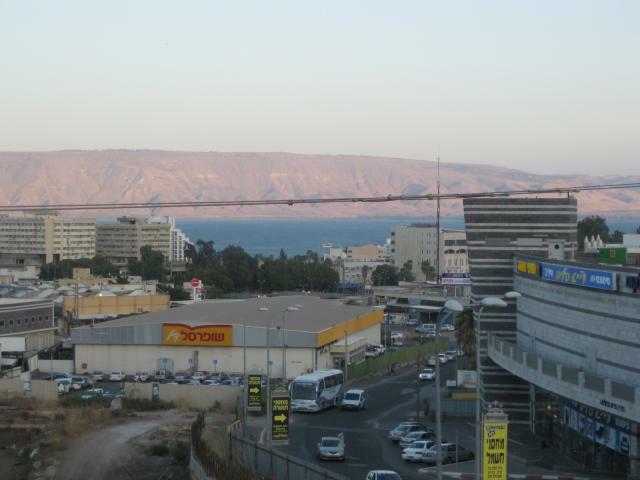 And here the Northern tip with the high rise buildings of Tiberias on the right. 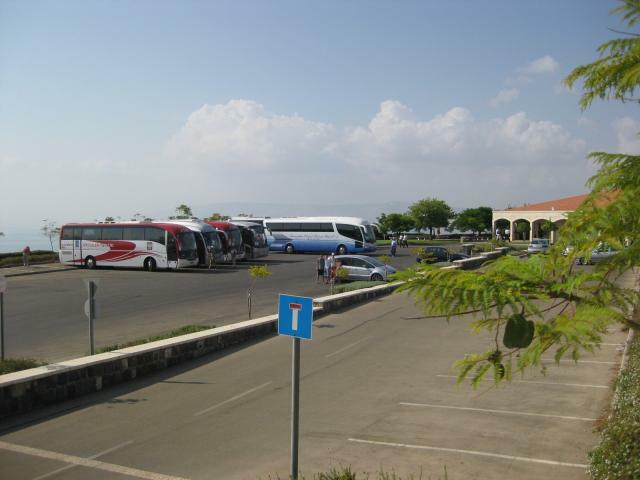 And one more picture, taken from the car park of a big supermarket, where we did our shopping. 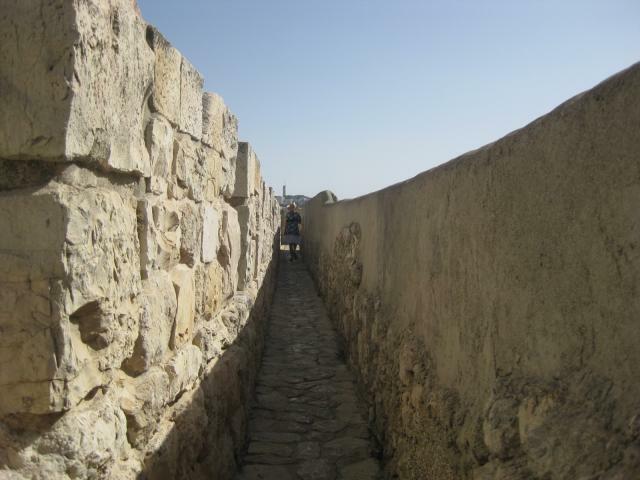 After climbing the Mount of Olives, we walked to the city of David (the old old city, North of and adjacent tothe current old city), and went into Hezekiah's tunnel (also Siloam tunnel). 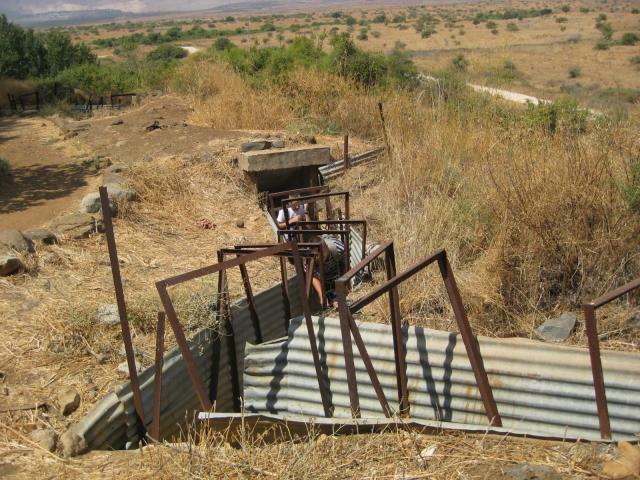 Hezekiah built this tunnel to make the water supply secure. 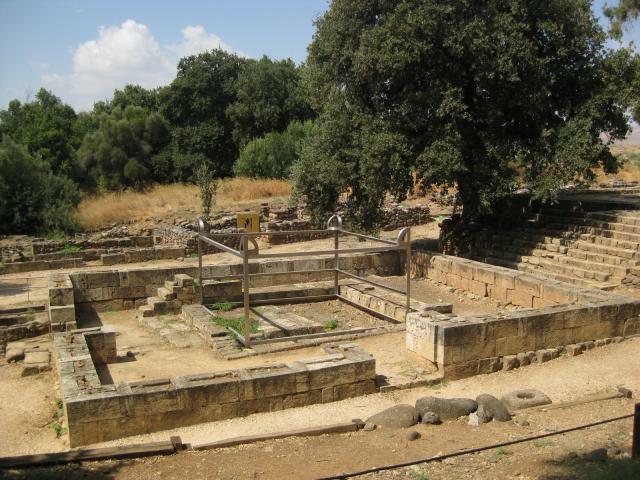 It leads from the Gihons spring to Siloam's pool. It's just wide enough for one man. The height varies a bit. Sometimes you can stand, sometimes you have to bow for a while. Basically you walk 533 metres through the dark if you turn of your flash light. Which the kids did, they wanted to walk through the dark. Not for claustrofobic people! The water is between 20cm to about 55cm or so, so you wade through water. 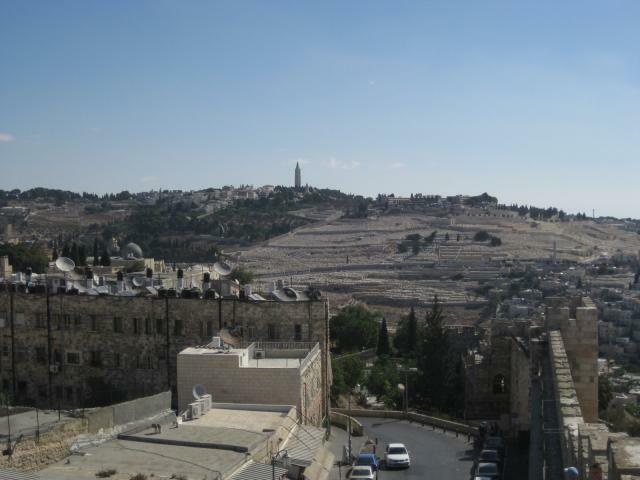 On Monday the plan was to walk up to the top of the mount of Olives. 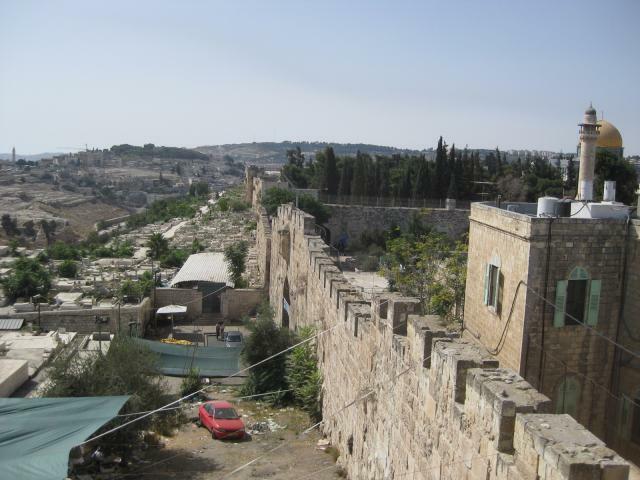 We wanted to start early, but take the car to the Mount of Olives, so we didn't have to walk the first part. Unfortunately navigating the car to the right spot proved quite difficult, so took almost an hour, while a walk would have been just 15 minutes. But our feet were sore enough. The walkway here crosses the Kidron brook (nothing left of that brook though). 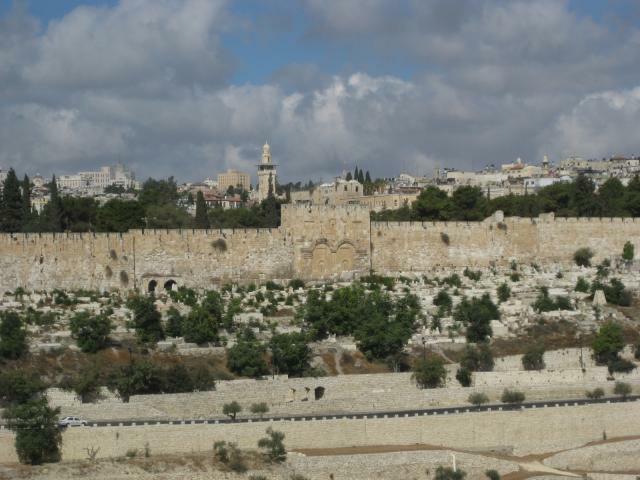 It goes to the city of David, the original Jerusalem, while the Jerusalem we see today dates from after that (Solomon already expanded it quite a bit). 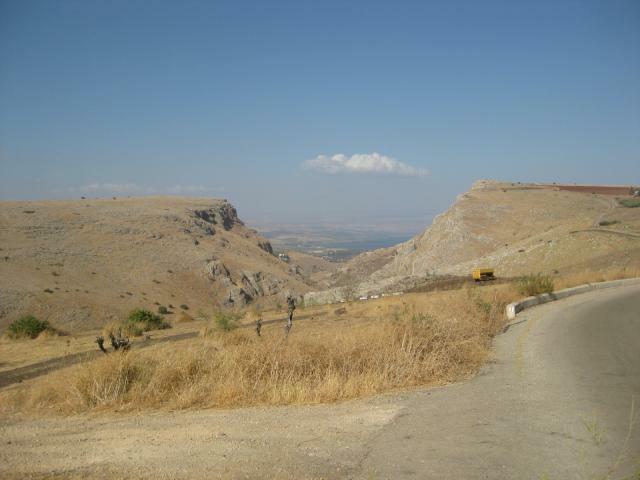 The valley itself is called Jehoshaphat valley, although not so in the Bible. It's first called this way in 333 AD. 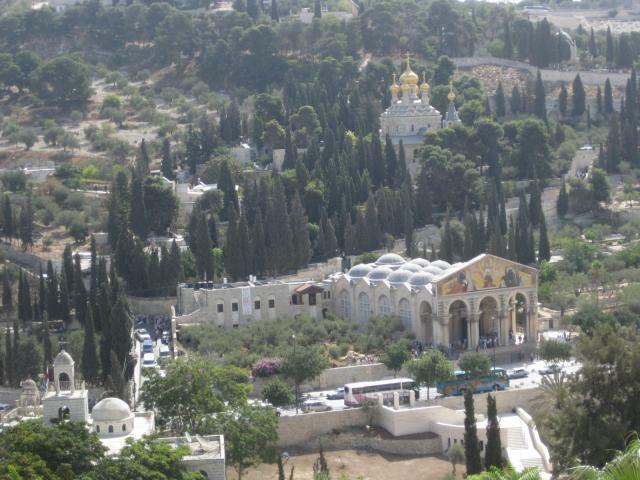 And this is from the other side, towards the mount of Olives. 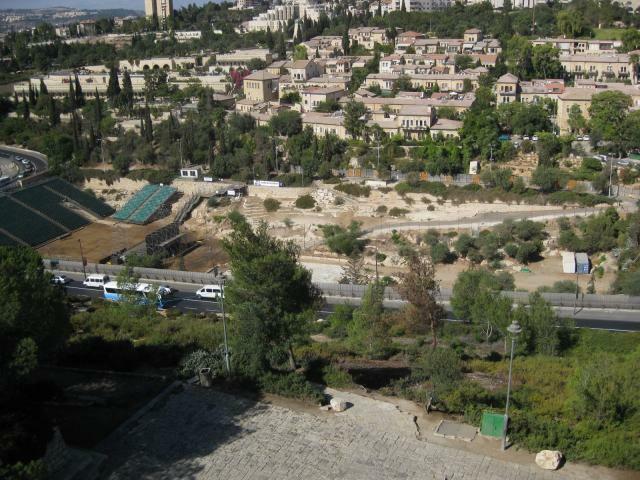 According to a sign this was the location of the garden of Gethsemane. There's a big church as well, which we didn't visit. 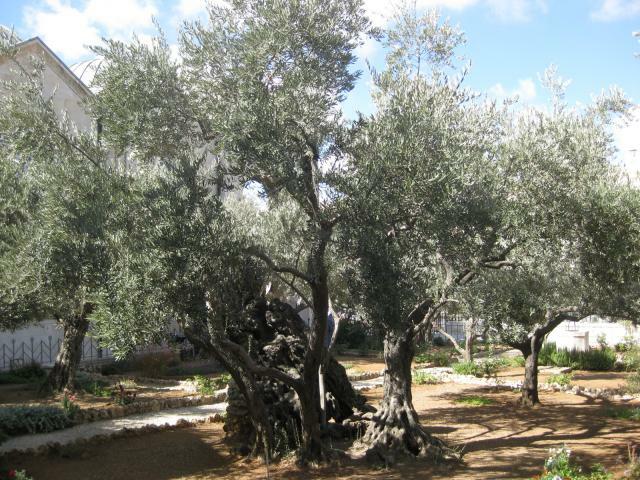 But we took a picture of the olive trees. 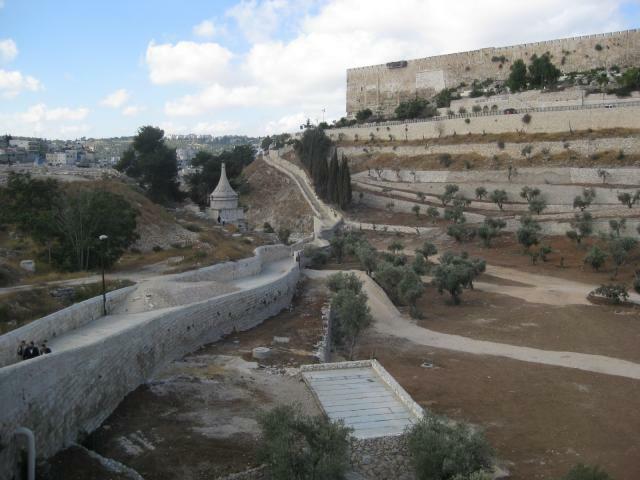 Obviously the Mount of Olives took its name from the many olive trees that used to cover it. But that's no longer the case. 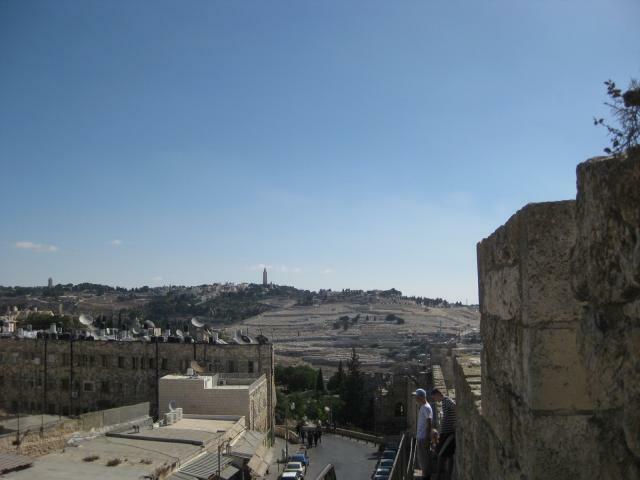 When you walk up the mount of Olives, you can clearly see the Golden Gate. As you can see, it is sealed off. 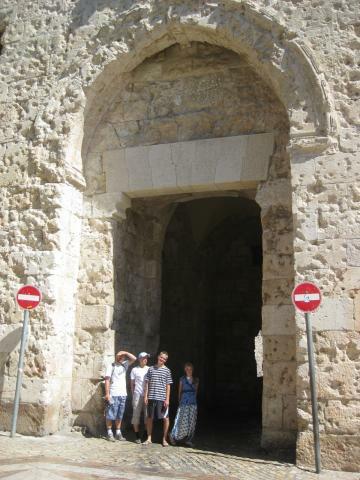 According to Jewish tradition, the Messiah will enter Jerusalem through this gate. That's why the Muslims sealed it off. 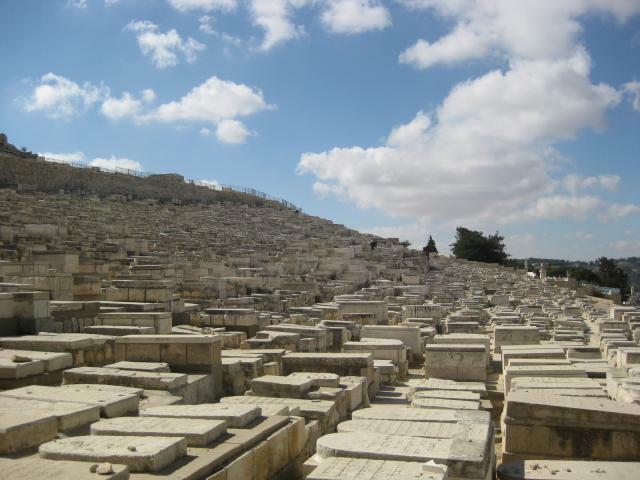 They even built a graveyard in front of it to prevent the precursor of the Messiah, Elijah, from passing through it. Here with a bit more context, i.e. with the Dome of the Rock on the left, and the Golden Gate on the right. 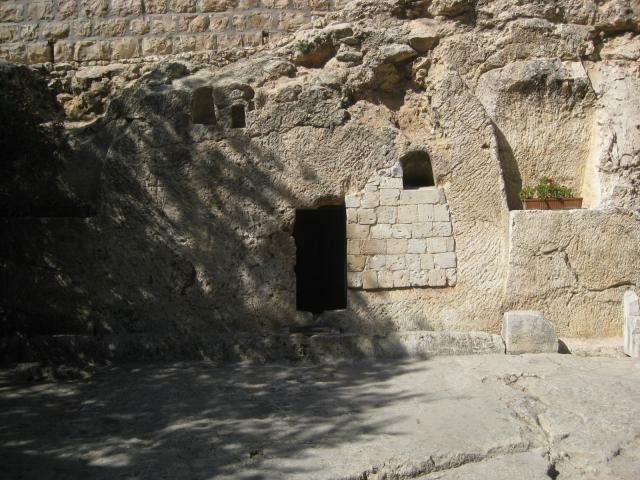 Jews like to be buried on the Mount of Olives as they also believe this is where the resurrection will take place. 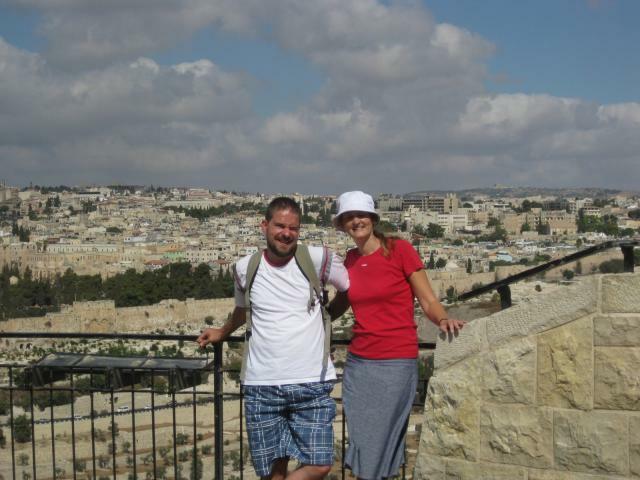 And us here on the top of the mount of Olives. If you see this, the word of the angels "this same Jesus, which is taken up from you into heaven, shall so come in like manner as ye have seen him go into heaven." or Zechariah's "And his feet shall stand in that day upon the mount of Olives, which is before Jerusalem on the east, and the mount of Olives shall cleave in the midst thereof toward the east and toward the west, and there shall be a very great valley; and half of the mountain shall remove toward the north, and half of it toward the south" look very remote. But perhaps as remote as was the return of the Jews to their own country when John Gill wrote, in the latter half of the 18th century: "but it brought forth out of the nations, and they shall dwell safely all of them; that is, the people of the Jews, the proprietors of the land of Israel, shall now be brought forth out of each the nations where they are scattered, and shall inhabit their own land, and dwell in the utmost security, having nothing to fear from their most potent enemies, even Gog himself; and though he shall come against them in the following manner. ..." He wrote that, while the actual event was still 200 years in the future. And we live in the times where this prophecy has been fullfilled. 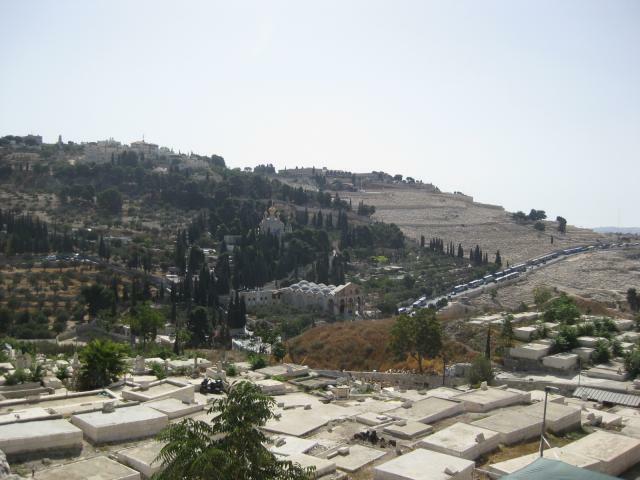 The other side of the Mount of Olives. Not very clear, but I could see the Judean desert starting over there. 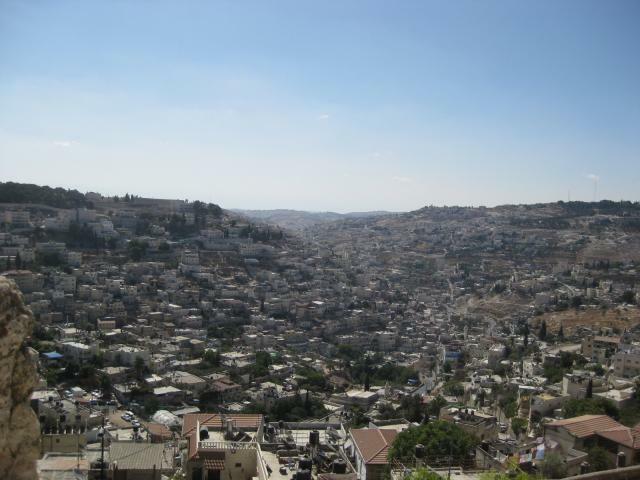 After we went down the hill, across the Kidron brook to the city of David. 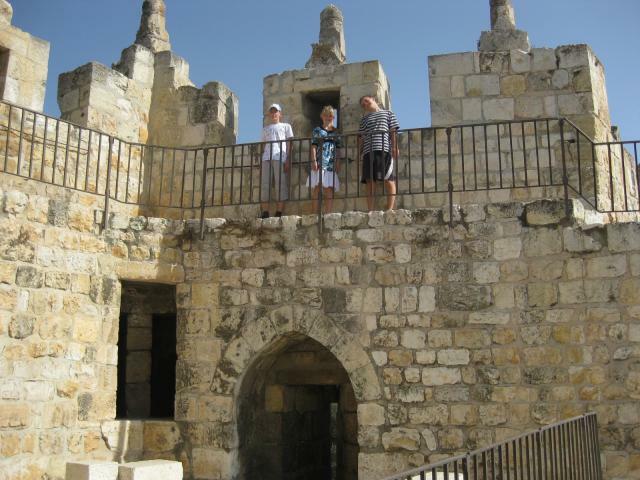 We wanted to do the second part of the ramparts and start early, so at 9am we were at the Jaffa gate again. On the wall, looking eastward. 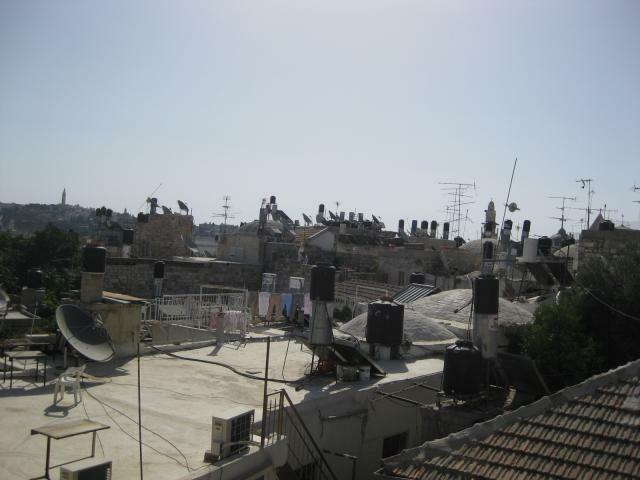 The roofs of Jerusalem, a bit different than 2,000 years ago I imagine. The ever present Dome of the Rock, built on the mountain of Moriah, the mountain where Abraham was commanded to sacrifice his son, and where later the temple was built. 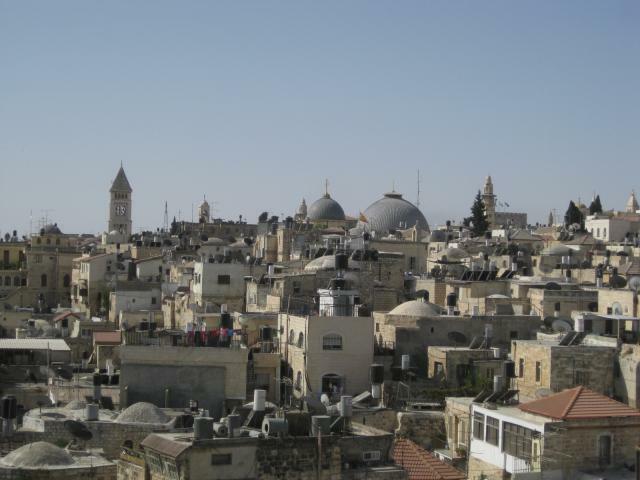 The domes of the church of the Holy Sepulchre. The location we visited yesterday. As you can see in the face of the hill you see a skull. On the southern part of the wall, looking West. 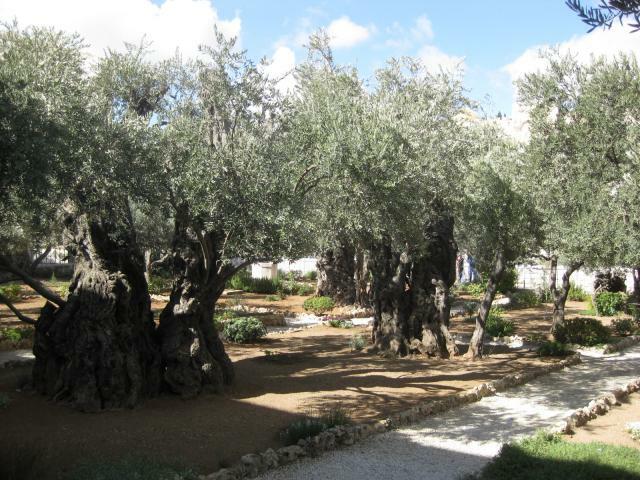 The garden of Gethsemane at the foot of the mountain of Olives. 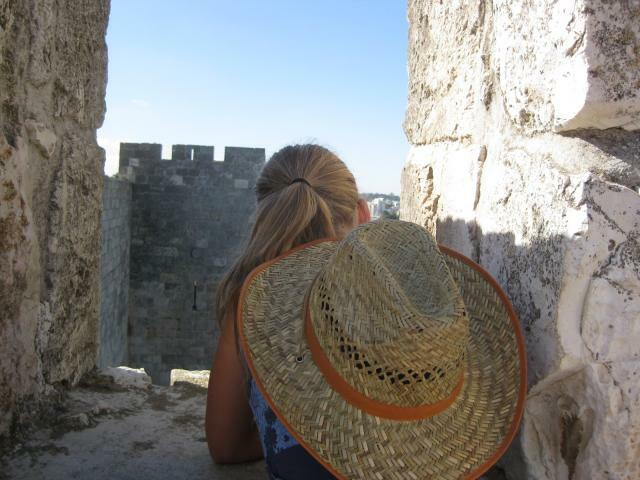 On Friday September 11 we were at the ramparts, slightly after 9am, the time when they open. It appeared however that only the south east section was open. Because it was Friday, the holy day for the Muslims, the other part was closed. Doing that one tomorrow. Looking West. 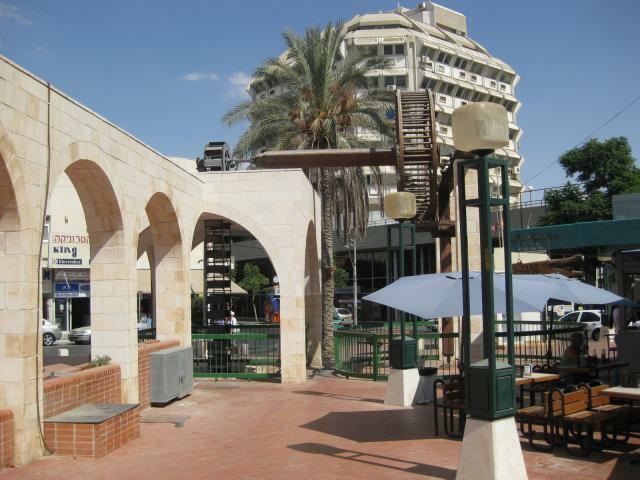 The hotel in the centre is the King David Hotel. 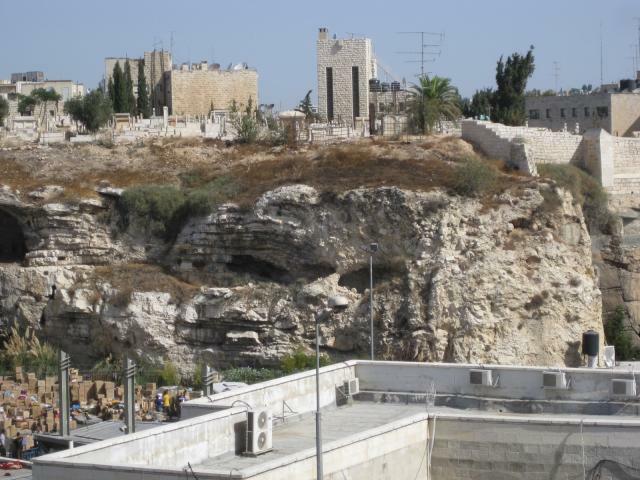 Between us and the King David Hotel is the Biblical valley of Hinnom, where the Israelites sacrificed their children to the Moloch. Topheth was here, and it is therefore also called Topheth. Here a look down in this valley. AnneRoos looking over the walls. 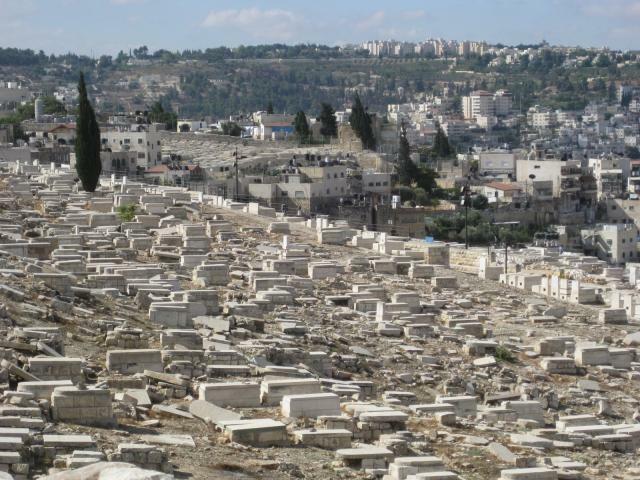 Looking East with the Mount of Olives just on the right, and the graves on this mount as well. 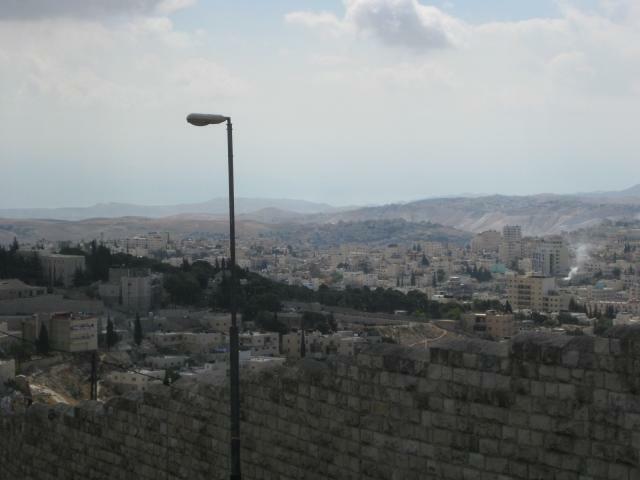 And a clearer view of the Mount of Olives. The hill is covered by graves. 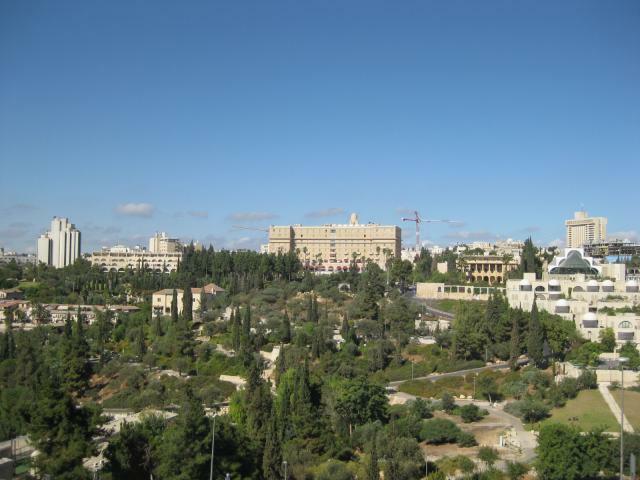 Jerusalem is surrounded by hills, and the city has sprawled out over them. At the Dung gate we couldn't continue, so we walked back outside the walls, and entered again at Zion gate. 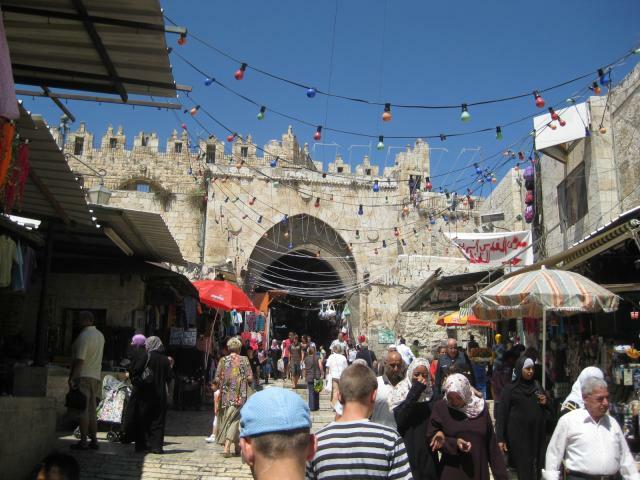 In shops in Jerusalem we saw a T-shirt with the slogan: "I walked my feet of in Jerusalem." And that's what we did. Jerusalem is best explored on foot, so we explored the old city on foot. Did we walk a lot! 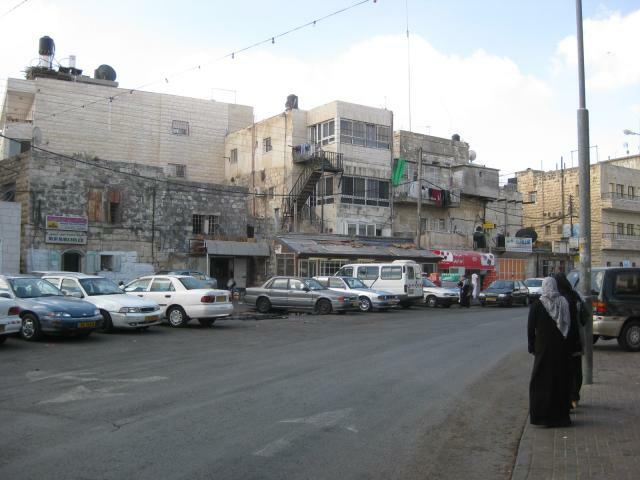 Jerusalem is a large sprawling city. But its centre is the old city. 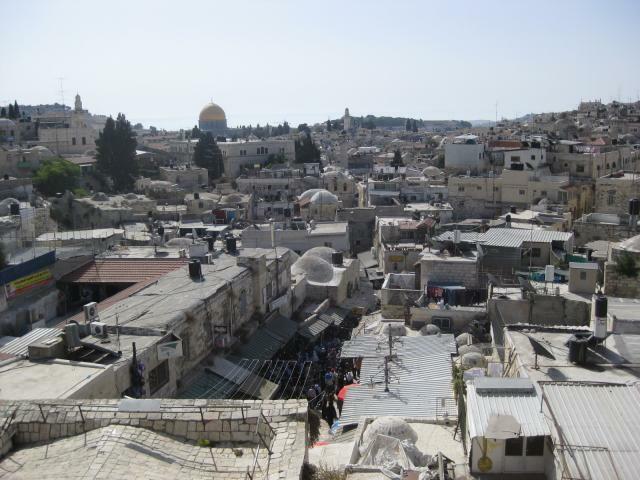 The old city is divided into four quarters: Jewish, Armenian, Christian and Muslim. 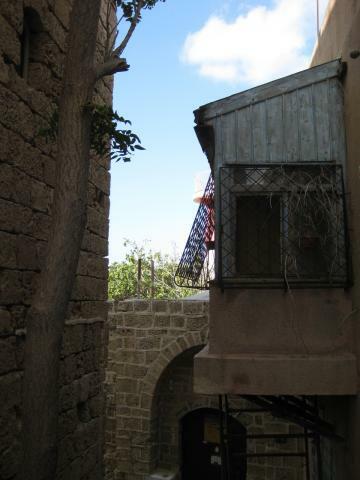 This is taken somewhere in the Jewish quarters. 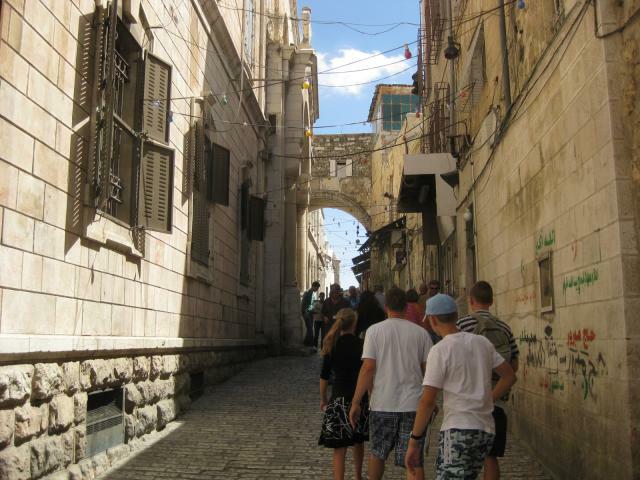 The Via Dolorosa is in the old city as well. 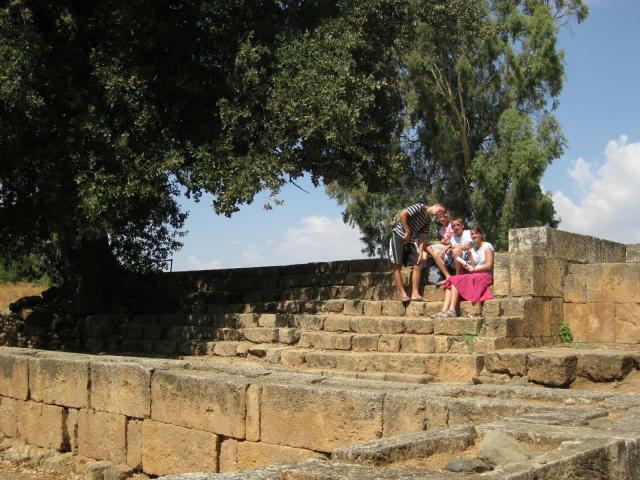 Supposedly the place where Simon of Cyrene was compelled to take over the cross. On the left you just see a portion of a cross that a large group of South Americans Catholics, our guess, were carrying around. Catholics and their churches are everywhere in this city. 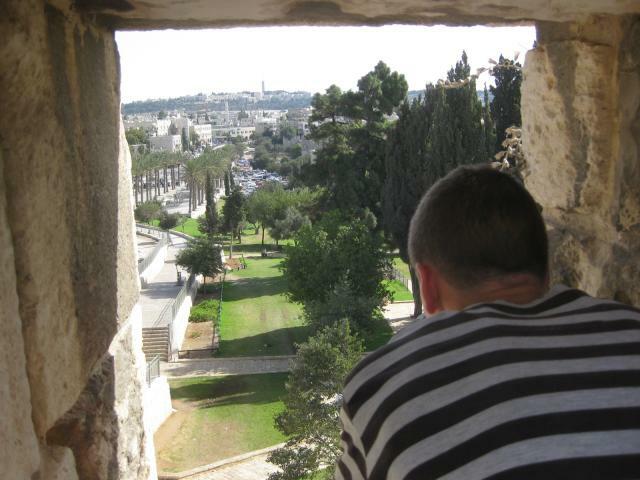 The Damascus gate, from inside the old city. 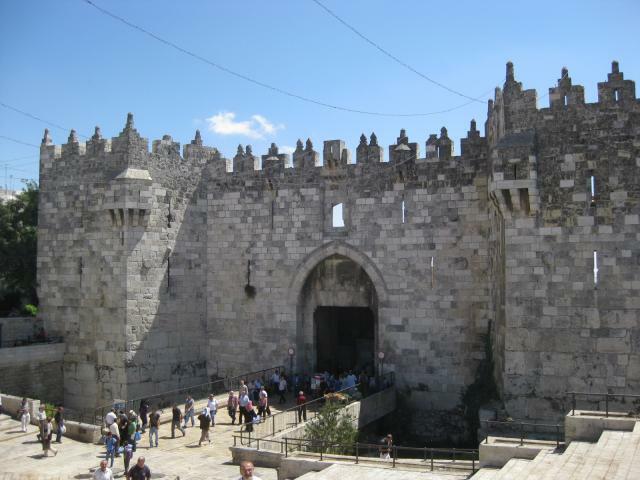 This is the gate Paul went through to go Damascus. 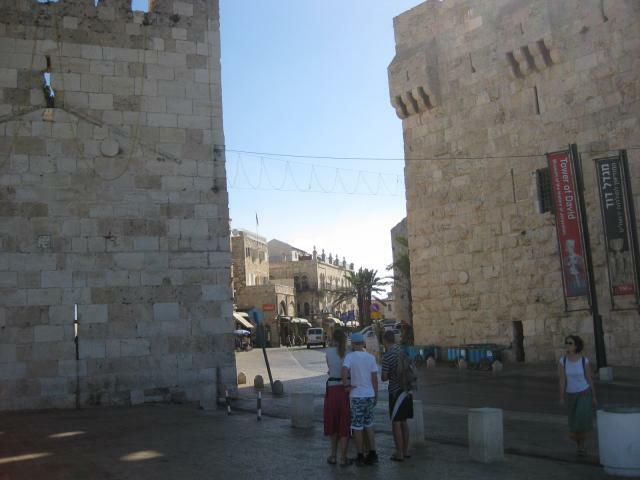 And the Damascus gate from the outside. 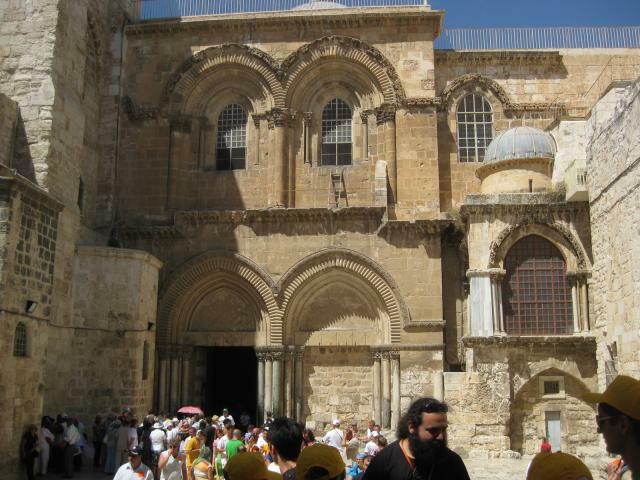 According to travel books this is the most holiest place for Christianity: the Church of the Holy Sepulchre. 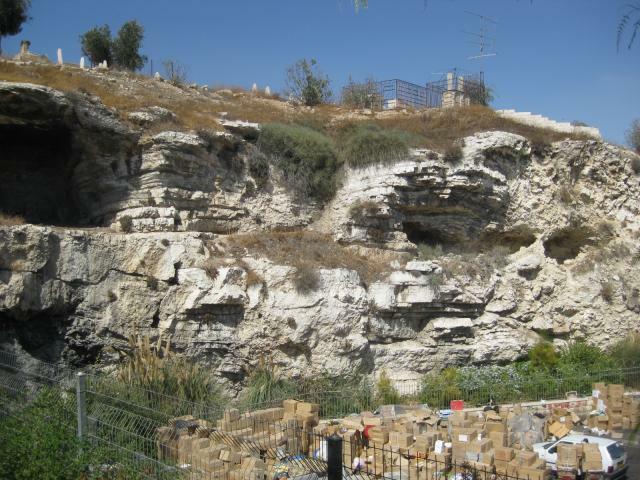 This is the supposed site of Golgotha. No hill can be seen anymore. The church on top of it is shared between the Greek Orthodox Church, the pope, the Eastern Orthodox the Armenian Apostolic and perhaps others. The church inside was extremely nice, but the idolatry was just expelling us. 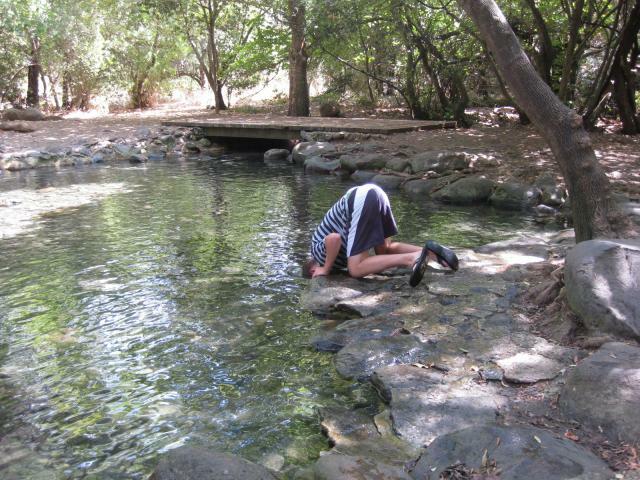 People were kissing the supposed stone of anointing (where Joseph of Arimathea prepared the body of Jesus) etc. etc. Very sad. The kids got banana with mango with some insistence from the shop owner. They actually liked it! So we went to the Garden Tomb, located outside the current city walls, and it has a hill which looked like a skull as well. Currently only the eyes and the nose are visible. There's also a tomb which is somewhat like tombs from that time. 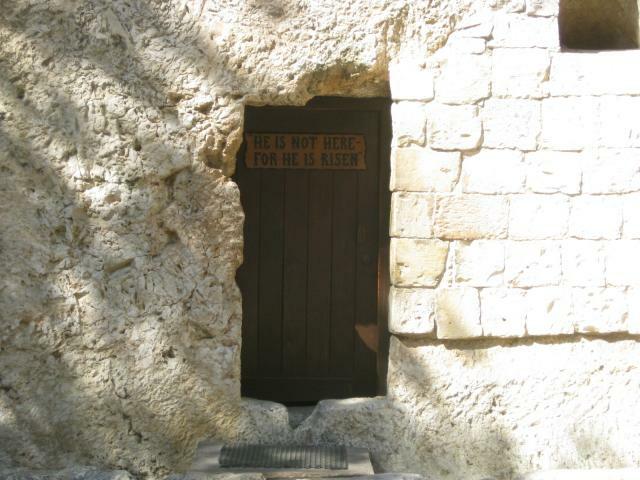 The door is normally open, but we closed it so we could take this picture. There's even a picture of a stone like they might have had in those times. 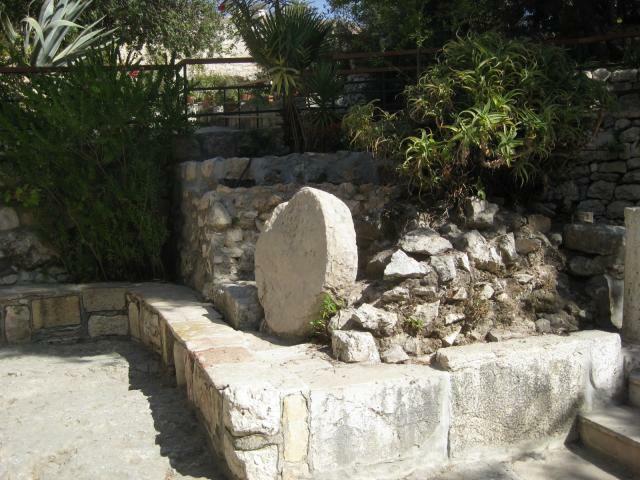 The stone for Jesus' grave was probably larger and heavier than this one. To be honest, I think the site of the church of the Holy Sepulchre is probably the site, but it doesn't look like anything of 2,000 years ago. But this site has some credentials, and certainly looks much more like things were 2,000 years ago. And then it was time to go home, and take care of my blisters.